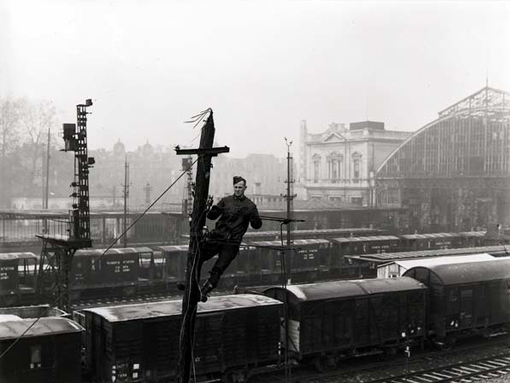 Signalman J. Bennett of the 1st Canadian Railway Telegraph Company installing wire on pole in station yards, Louvain, Belgium, 6 January 1945. Photo by Barney J. Gloster. Department of National Defence / National Archives of Canada, PA-130257. The mission of the Auxiliary Corps is to provide the Armed Forces with all the supplies and resources they need to do their job. Many soldiers, who already had the required skills when they enlisted, were directed towards these corps. For others, it may have been the opportunity to learn a new trade. Some auxiliary corps, such as the postal services, worked behind the lines and, normally, did not t come under fire, while others, signalmen for instance, were assigned to combat units and shared the life of regular troops. They all played a vital role and they all faced the dangers that an army can encounter when advancing in enemy territory. Communications are a key concern for a modern army, given the number and size of the units that need to be coordinated. The Royal Canadian Corps of Signals sets up and maintains communication lines as required between the staff and the troops: radio, telephony, teletype, telegraph, motorcycle messenger service. An army on the march means huge concentrations of men and vehicle of all sorts, advancing on untested ground, taking roads that the enemy may target at any time. In addition to its police duty, the Canadian Prevost Corps ensures road marking and safe circulation. “Slow, Dangerous Curves Ahead”. Humour goes a long way when road signs must be read by young men – the majority of the Army. No. 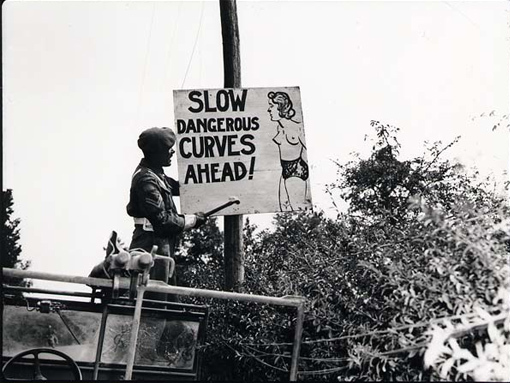 2 Canadian Provost Company Corporal Ernie Nault of Meadow Lake, Saskatchewan, puts up sign along the road to Falaise, Normandy, 13 or 14 August 1944. Photo by Michael M. Dean. Department of National Defence / National Archives of Canada, PA-131272. See John Cameron’s Canadian Military Police Virtual Museum. 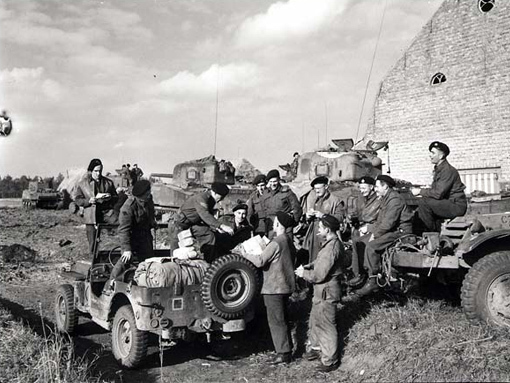 The mail jeep of the “A” Squadron of the Fort Garry Horse making its first stop for deliveries in France or Belgium, 11 October 1944. Photo by Michael M. Dean. Department of National Defence / National Archives of Canada, PA-140198. Away from home, sometimes for years at a stretch, men and women of the Canadian Army rely on the Postal Corps to keep in touch with their families. Maintaining that precious link with loved ones boosts morale and helps soldiers remain confident that one day, they will make it back home. It is the Postal Corps’ mission that every single letter or parcel reach its destination, whether in Canada, in Great Britain, or “somewhere in Europe”. 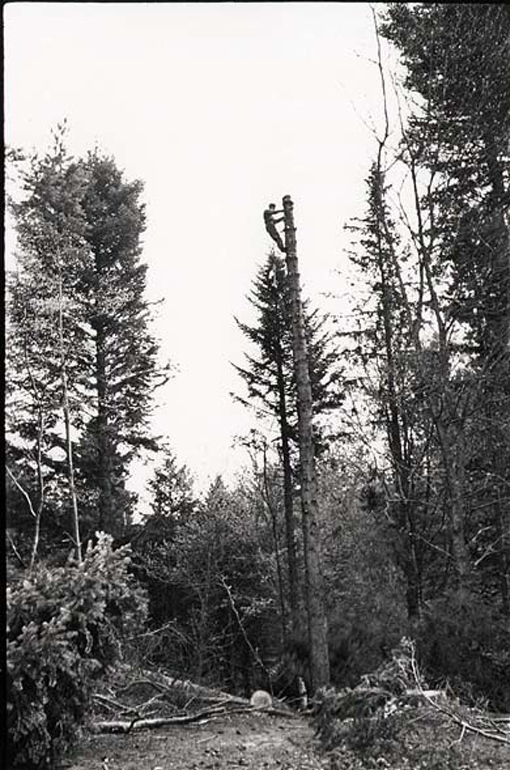 High rigger atop spar tree, Canadian Forestry Corps, Scotland, 1941. Department of national Defence / National Archives of Canada, PA-175325. An urgent need for lumberwood led to the creation of a special service, the Canadian Forestry Corps, in 1940. Its main task was the exploitation of Scotland’s forests; in 1943 it was 220 officers and 6,771 men strong, posted in the British Isles. Starting in 1944, the Forestry Corps had to provide lumberwood for the invasion forces. Logs, formed into rafts, were to be floated across the Channel in the summer of 1944. But as early as July of that year, Forestry Corps men were sent over to the Continent, to work in the forests at Cerisy (France), Waterloo (Belgium), and in the Ardennes, where German attacks forced them to retreat in a hurry. They resumed work in Belgium, and later, in the Reichswald and Hochwald forests, where bloody battles had just been fought.